Hugh Jidette – a play on the phrase “Huge Debt” – is a fictional presidential candidate who has been created to capture the attention of the nation and bring to light the facts about our federal fiscal challenges and the threats they pose to our nation’s economic future. 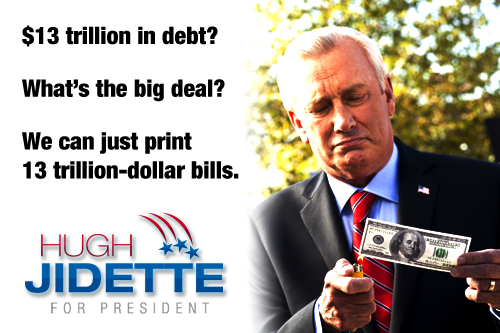 As his name suggests, Hugh Jidette is a satirical character, and his policy positions sound strange and unbelievable. In the days ahead I would like to blog a bit about the recommendations from President Obama's debt reduction committee. I think that hard fiscal decisions need to be made in the days ahead. Anybody agree? Anyone think congress will really cut spending? Mommy is never popular when she takes away the cookies, or makes you take medicine. As long as we the voters continue to reward those who make short-sighted decisions, no serious cuts will be made in defense or medicare. So far there have been no reports from the committee, just the two committee heads. I do wonder why they felt the need to push their opinions in advance of the full committee report due in December. Perhaps they know that the group will not reach the necessary consensus. It's interesting that Congress never did go with idea of creating an outside, bi-/non-partisan committee to create a proposal and allowing that proposal to face an up or down vote. Instead, Obama had to create a separate commission with absolutely no commitment from Congress. I thought legislators would have jumped at the chance to pass the buck of hard decision making to external consultants.